Home Whatsapp Disable Whatsapp 'Blue Ticks' On iphone And Android. 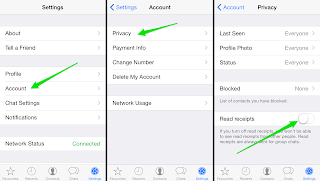 Disable Whatsapp 'Blue Ticks' On iphone And Android. Hey Friends wassup...!! 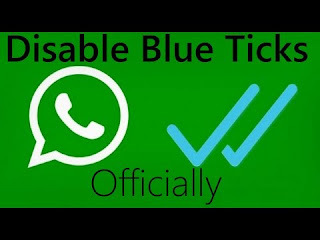 Today I'm gonna tell you how to disabke whatsapp "blue ticks" seen feature on iphone and android . You just have to follow bellow given steps one by one. As we all know about whatsapp, now a days people uses whatsapp more then any other app to send their messages freely. Whatsapp is really cool and pretty easy to use. 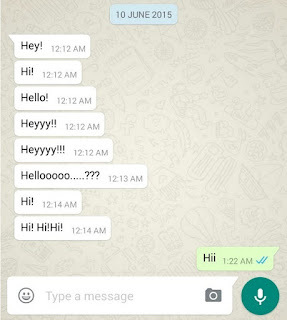 As we all know when ever we send any message on whatsapp first it shows us a single tick which means that your message was sent, then it will show you double tick which means your messages has been delivered and then finally it show you two blue ticks which means that your message has been seen by his or her (message receiver). Some people found this whatsapp blue ticks feature really helpfull but some are really against this blue ticks feature because sometimes we don't wanna send any reply or we can't send reply due to any reason and we leave the message after reading it. But once we have open that message and read it, whatsapp will show the sender blue ticks and then he/she will come to know that we have read their message and then we just have to send reply forcefully so that they will not feel ignored. Whatsapp is now giving us a new feature named as 'read receipts' which lets us to disable whatsapp blue ticks feature but it will disable blue ticks of your also means you also can't be able to see whether anyone has seen your message or not. So lets directly come to the point how to disable whatsapp 'blue ticks' feature.. If you have the latest version of whatsapp then leave first two steps and continue with third step. You may also like "How to Disable facebook seen feature". Step 1 :- First of all go to your phones settings and then enable or tick that 'Allow unknown sources'. Step 2 :- Now you have to go to whatsapp official website and then download this apk file and install it ( this will install the latest version of whatsapp on your phone). Step 3 :- Now once you have installed that apk file then open whatsapp and then go to whatsapp settings. Step 4 :- Now click on Account and then tap on Privacy. 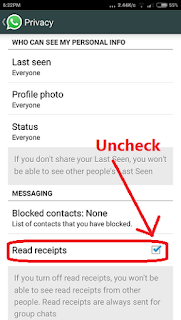 Step 5 :- Now you can see a new feature has been added named as 'Read Receipts' just disable or turn off this read receipts feature this will automatically disable blue ticks on whatsapp messages. You may also like "How to use two whatsapp account on one phone". Step 1 :- First of all open your whatsapp and then go to your whatsapp settings. Step 2 :- Now click on 'Action' and then tap on 'Privacy'. Step 3 :- Now just turn off this 'Read Receipts' option. Now you have successfully learned how to disable whatsapp blue ticks on iphone and android.